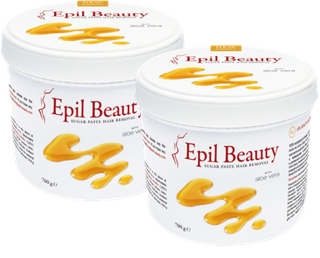 Sugar paste EPIL BEAUTY is approved by Prague National Health Institute. EPIL BEAUTY is 100% natural product, it has no chemical ingredients. EPIL BEAUTY contains Aloe Vera which regenerates your skin and prevents any inflammation after the procedure. Sugar paste can be cleaned up easily with water, which means it can be removed from your skin at any time. It is applied at body temperature and will not burn your skin. Sugar paste adheres only to the hair and dead skin cells. It does not damage the skin and also minimizes the risk of inflamed pimples. The paste removes dead skin cells so after the procedure the skin is also exfoliated. With this method hair is only removed in the natural direction of growth. In addition, the sugar paste seeps into the hair follicle which helps lubricate the hair root allowing the root to be removed completely without breaking and with less pain.